Engineer: Kadrmas, Lee, & Jackson, Inc. 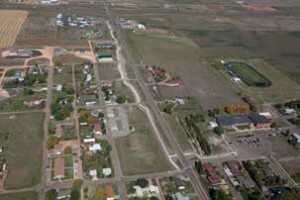 The City of Beach isn’t the center of the oil boom, but they have seen some growth and increased traffic associated with it. With increased traffic comes the need to provide safe paths for walkers, joggers, and bikers. 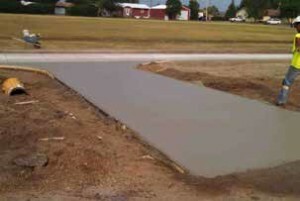 To provide safe walkways and bike paths from the school to the businesses located on the north side of town, the city chose to construct a new concrete multi-use path. The project consisted of nearly 3,200 linear feet of 10 ft. wide path running parallel to ND Highway 16, and nearly 400 linear feet of 5 ft. path which runs directly beside the high school. 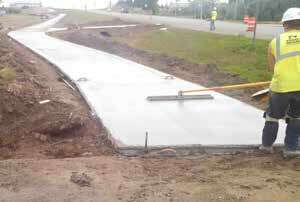 In total there is roughly 3,600 linear feet of path concrete. The project used 450 cubic yards of 4,000 psi concrete to complete the project. Dirt work for this job was started in July, the concrete work began in August. Knife River tailgated the entire job, which was hand formed and hand finished. No mechanical finishing tools were used to complete this project. The project was completed on schedule in late September of 2015. Beach has typically used concrete for the city’s sidewalks and multiuse pathways in the past, so concrete provided consistency with their overall system. But durability remains the primary reason for choosing concrete instead of the asphalt alternate. Improved safety, because of the lighter surface and better reflectivity, was also a consideration. The end product is a light, bright, safe, and durable multi-use path for all to enjoy.